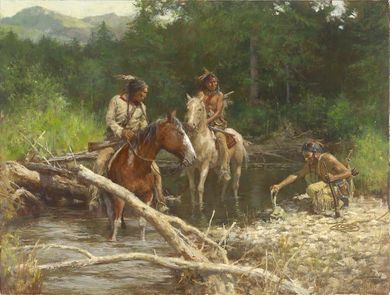 Home | New Releases | Howard Terpning Artist Signed Limited Edition Canvas Giclee:"Blackfeet Scouts in the Flathead Valley"
Howard Terpning Artist Signed Limited Edition Canvas Giclee:"Blackfeet Scouts in the Flathead Valley"
Size: 32" w x 24" h.
Edition: Artist Signed and Numbered to 60 with COA. About the Art: These Blackfeet scouts are searching for adventure in the Flathead Valley of Montana. They were generally enemies of the Flatheads and would pick a fight if they had the advantage. In this scene, the men have discovered a beaded pouch. By examining it, they will likely determine the tribe it belongs to. The Flathead people had settled in the Bitterroot valley to the south of the Flathead Valley, but they roamed far and wide in search of game, including the area around Flathead Lake. The weather is partly cloudy in the painting so it allows for interesting play of light and shadow. The mountain range in the background is identifiable as the Mission Range. Home | Framed Art | Western Art | Howard Terpning | Howard Terpning Artist Signed Limited Edition Canvas Giclee:"Blackfeet Scouts in the Flathead Valley"
Home | Fine Art Prints & Limited Editions | Native American Art | Howard Terpning | Howard Terpning Artist Signed Limited Edition Canvas Giclee:"Blackfeet Scouts in the Flathead Valley"
Home | Fine Art Prints & Limited Editions | Greenwich Workshop | Howard Terpning | Howard Terpning Artist Signed Limited Edition Canvas Giclee:"Blackfeet Scouts in the Flathead Valley"
Home | Fine Art Prints & Limited Editions | Western Art | Howard Terpning | Howard Terpning Artist Signed Limited Edition Canvas Giclee:"Blackfeet Scouts in the Flathead Valley"